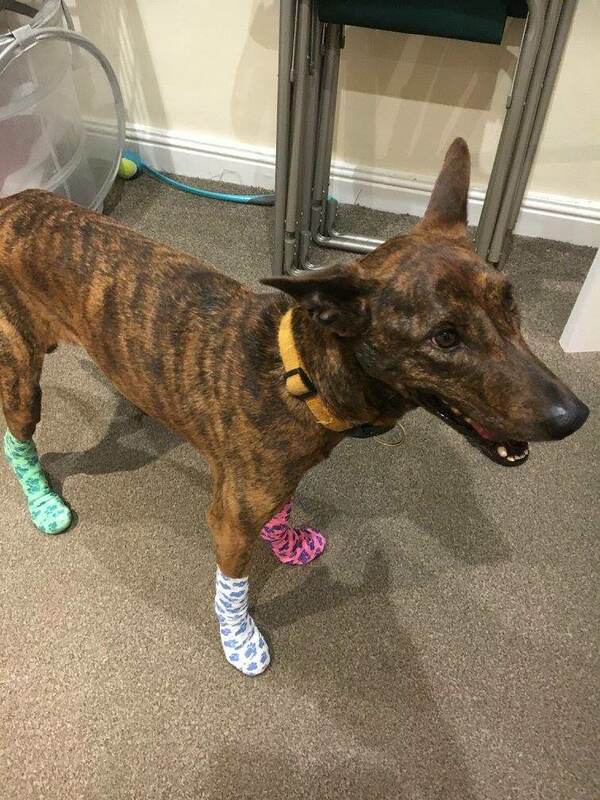 A dog who escaped out of a window and got trapped between a conservatory and a brick wall after becoming spooked by fireworks is recovering after a three-hour operation to rescue her. Taba was discovered tightly wedged head-first in a six-inch-wide gap in the back garden of a house in Oxhey Road, Watford, by a concerned woman on the evening of Saturday 4 November. She immediately called the RSPCA, and inspector Rachel Smith arrived within half an hour. Despite Rachel’s best efforts in trying to get Taba out, she was not budging – so Rachel contacted Hertfordshire Fire and Rescue Service to assist. An emergency vet also attended to sedate Taba, who was extremely distressed. Three hours after starting their rescue, and with fireworks going off around them, Taba was safely freed using ropes to pull her out. Rachel said: “Taba was very lucky to have been found in the first place. The lady who called us only found Taba stuck down the side of her conservatory after her cats started to act strangely in the garden. “Taba, who isn’t a small dog, ran into the gap head-first, possibly because she was spooked by fireworks, but then she got completely wedged. She barely had room to breathe. 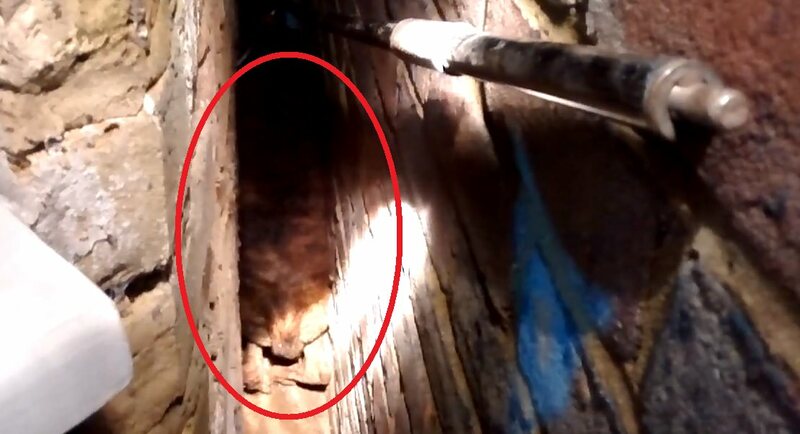 “She was so scared and distressed – I was concerned that she was going to wedge herself in even tighter, but I managed to get a hook around her collar and hold her in place while I called the fire service. After Taba was sedated, the fire officers and Rachel managed to safely pull her out. Amazingly, apart from sore paws, she didn’t sustain any serious injuries following her ordeal. Rachel said: “It was obvious that that Taba was distressed and disorientated. We really wanted to get her back to her owner – and thankfully she was microchipped! I spoke to her owner, who had been worryingly looking for her after she went missing the night before. It transpired that Taba had escaped from the window of a first floor room while her owners were out the evening before, climbed along a glass roof conservatory and then taken herself off for a walk. “She is now at home safe and well and a little more subdued than normal!” said Rachel. “It just goes to show how important microchips are. Her owners are so pleased that she is home. “Jobs like this make me so proud to work for the RSPCA and it is a reminder of how awesome our fire brigade are. We are so lucky to have them. In These Movies They Claimed No Animal Was Hurt, But Were They Actually Telling The Truth?